I often wonder about our preoccupation with how much sleep our children need. I think we subconsciously need to know that our children do need more sleep than they are actually getting in the hope that they will eventually learn how to sleep for longer. And all of this in order for us to be able to close our eyes for a little bit longer. Sleep is important to all creatures and all people of all ages. We need sleep to give our bodies much needed rest to prepare for the next day. When we sleep, our brains brain sorts and stores information, replaces chemicals, and solves problems. Without sleep we become cranky, clumsy and not very nice to be around. We now know why we need sleep, but just how much do we need? 1 – 4 Weeks old: Newborns need between 15 and 16 hours of sleep in a 24 hour period. Unfortunately for tired mommies, they sleep for short periods of two to four hours at a time. Having not developed a circadian rhythm, they do not discriminate between day and night. Premature babies generally sleep more and colicky babies sleep less. 1 – 4 Months old: Babies of this age need between 14 and 15 hours of sleep per day. Luckily they develop more regular sleep patterns during this period. They start sleeping for longer periods at a time – 4 to 6 hours and generally this will be at night. 4 – 12 Months old: Babies still need between 14 and 15 hours of sleep, but it is becoming predictable with 3 naps during the day and a long stretch at night. A mid morning nap at about 9 am for about an hour, and early afternoon nap at about 12 for 1 to 2 hours and a late afternoon nap at about 4 will be enough rest during the day. At about six months old, baby will drop the early morning nap and hopefully start sleeping through the night. 1 – 3 Years old: Toddlers need between 12 and 14 hours sleep a day. After 18 months baby usually drops another nap and therefore starts sleeping for longer at night. 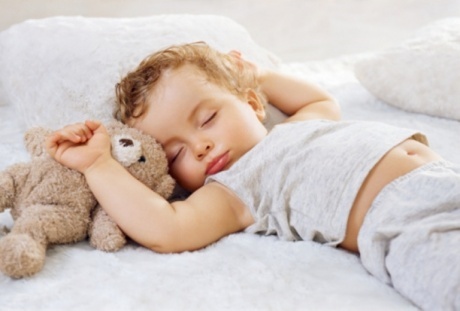 Toddlers typically go to bed between 7 and 9 at night and wake at between 6 and 8am. 3 – 6 Years old: Children of this age need between 10 and 12 hours of sleep at night. Up to the age of 3 they will probably still nap during the day, but at 5 years old we would expect a child to only sleep at night. 7 – 12 Years old: With school and busier social schedules, children start going to bed later and therefore do not always sleep as much as they should. The ideal is that they should still get between 10 and 11 hours of sleep, but on average this age group only gets 9 hours of sleep at night. 12 – 18 Years old: Sleep is especially important for growing teens. When we get upset with our teenagers that sleep until 11 over weekends, they are actually only doing what their bodies need. Teenagers manage well on between 8 and 9 hours sleep at night, but often have to make do with less due to social and school pressures. Parents: Parents do best on as much sleep as possible. Unfortunately we have to fall in with our children’s sleep schedules and therefore often walk around with dark rings around our eyes. Do not become concerned when you see a mommy nodding off in the park or in the car waiting to pick up her darlings from school.